Craftster Community > CRAFTSTER CRAFT CHALLENGES > Archive of Past Craftster Challenge Entries > CHALLENGE 12 ENTRIES > Anyone want a pet thumbelina?! habitat included! Anyone want a pet thumbelina?! habitat included! Alright, well this is my first craft challenge here on craftster. I really enjoyed participating! 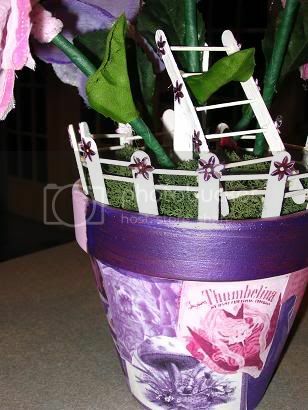 It's a flower pot, but not just any flower pot! It's thumbelina's little home. Here's a close up of one of the flowers. 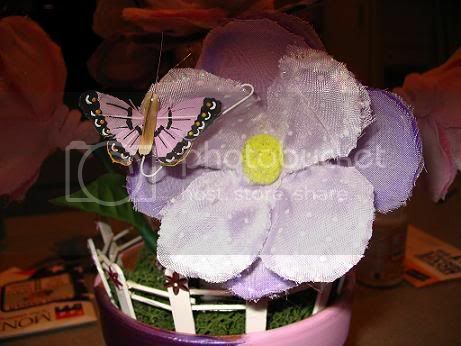 Pipe cleaners were used to make the frames of the flowers and then i draped them with fabric and glued it on. Pompoms were used for the centers. The stems were made by wrapping florest's tape around a green wire. That was kind of a pain to do at first when I realized that florest's tape isn't exactly sticky. 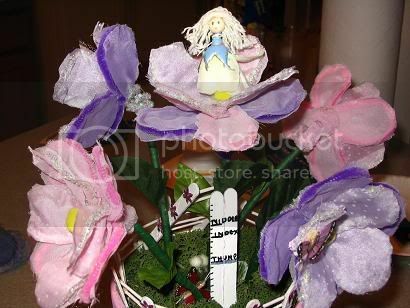 Here we have Thumbelina--she's made of a flower turned upside down with a wooden bead as her head. I painted the green part of the flower silver to make it look like a part of her dress. Her hair is made of yarn which i unraveled a bit. I used some painted wire to make her arms. 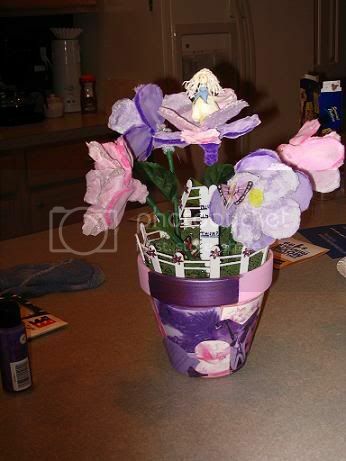 I was inspired by this little flower girl I bought at a craft fair long ago. I'm pleased with how cute she is! Here's the back of the little habitat. She has a little ladder which is made from popsicle sticks and toothpicks. Poor little thumbelina is too short to get up to her flower all on her own! Also: this is a good view of the pot. These pictures are scenes from the thumbelina fairytale, and are mostly illustrated by Robyn Officer. I put them in photoshop and turned them all shades of pink and purple to match. 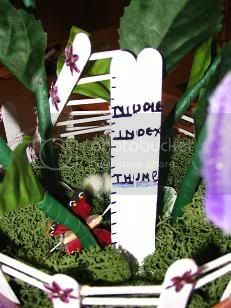 A close up of Thumbelina's measuring stick--so far, she's only a thumb tall. Her goal, for now, is index finger. Can she do it?! I hope you guys enjoy my little project! I was a little nervous during the making of it, because my cat kept trying to get to it. At one point she had thumbelina in her mouth! Other than that, it was fun; and the hot glue gun and I had a lot of bonding time. (haha..get it? bonding time. Yeah I know, I'm hilarious.) Thanks for looking! Re: Anyone want a pet thumbelina?! habitat included! that is adorable! I love the little thumbelina! I love the whole thing actually -- it's a very clever idea! I love this!! I must make one!! good job!